SHUFFLE Concert changes the rules of performance at Pepperdine University's Smothers Theatre at 2 p.m. on Sunday, March 8. You Choose. They Play. SHUFFLE Concert is a genre-bending chamber music experience. In this musical celebration, the audience chooses what pieces will be performed. From baroque, classical, and romantic to jazz, pop, and Broadway, SHUFFLE Concert offers an exciting fusion of great music for every taste. SHUFFLE’s creative director and pianist, Eliran Avni, was on the elliptical machine at the gym when his MP3 player jumped from a Pretenders song to the first movement of Prokofiev’s Fifth Symphony, nearly causing him to lose his balance… and thus, the idea for SHUFFLE Concert was born. In SHUFFLE Concert’s original form, a computer program randomly selected the pieces performed, simulating the shuffle mode on an MP3 player. This later transformed into the unique concept of letting the audience decide which pieces would create the program. For perhaps the first time in the modern performance of classical music, the audience decides what happens next on stage. 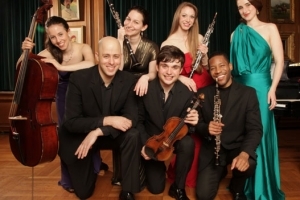 Each of SHUFFLE’s members is an exceptionally accomplished chamber musician; they are graduates of such schools as Juilliard, New England Conservatory, Oberlin, Manhattan School of Music and Bard College. Ariadne Greif, Adrienne Pardee (soprano); Brendan Speltz, Francisco Fullana (violin); Linor Katz, Sofia Nowik and Brook Speltz (cello); Moran Katz (clarinet); Eliran Avni (piano); Hassan Anderson and Jessica Pearlman (oboe) have all individually won numerous prizes and have performed extensively as soloists and collaborative musicians throughout the world. Since its inception, SHUFFLE Concert has performed in a variety of concert settings, from the Duplex, a cabaret space in the West Village of New York, to the Rose Studio at Lincoln Center. The ensemble has also given performances at Merkin Hall, Greene Space and Carnegie’s Weill Recital Hall in New York; Buck Hill Skytop Music Festival in Pennsylvania; Ottawa’s Chamberfest; and Rhinebeck Chamber Music Society; and presented residencies at East Stroudsburg University and Gettysburg College in Pennsylvania; Molloy College on Long Island; Mirman School in Los Angeles; The Dalles Middle school, Oregon; and the International School in Herzeliya, Israel. In October 2014, the ensemble traveled to Israel for a fourth tour, at the invitation of the Felicia Blumenthal Chamber Music Center, and will be returning there in November 2015. The ensemble’s Merkin Hall debut was broadcast on WWFM and WQXR and included the premieres of new works by Avner Dorman and Jonathan Keren. The ensemble’s debut CD was launched in summer 2013 and its First International Composition Competition in the summer of 2014. The competition awarded three prizes to composers Piotr Szewcyzk, Kevin Wilt and Oran Eldor for their original compositions for the ensemble. Future projects include the launch of the SHUFFLE app, which will allow audiences to vote via a smart phone application. The ensemble was recently selected as one of five ensembles presenting at the prestigious YPCA showcase at Carnegie’s Weill Recital Hall. Tickets are $15 for adults and $10 for full-time Pepperdine students. For tickets and more information, please call (310) 506-4522 or visit the Center for the Arts website.